When a baseball is pitched, hit and flies in the air, one or more of the physical principles formulated over 300 years ago by Sir Isaac Newton act on it. Folklore tells how the mathematician and physicist first realized the law of gravity while observing a falling apple. Had Newton watched a baseball game instead, he might have formulated all three laws of motion by the seventh-inning stretch. Newton's First Law of Motion states that every object remains at rest or in uniform motion in a straight line unless compelled to change its state by the action of an external force. Hall of Fame pitcher Nolan Ryan recorded 5,714 strikeouts, as documented in the Baseball Almanac, using the first law when throwing his trademark fastball. Ryan held the baseball at rest in his glove as he looked at the catcher’s signs. After receiving a sign, he went into his windup and set the ball in motion toward home plate with an overhand delivery. In addition to Ryan’s ability to throw a fastball at 100 mph, he understood the physics of air pressure acting upon the surface of a spinning ball. Putting lateral spin on his fastball caused the ball to move several inches sideways as it crossed home plate, making it virtually impossible to target as a hitter. Prominent pitchers use the first law of motion to throw fastballs, sliders and curve balls. Newton’s first law is realized at both ends of a pitch. The pitcher’s delivery sets the baseball in motion and the hitter sets the bat in motion by swinging. Newton's Second Law of Motion (F=M*A) shows the velocity of a mass object changes when it is subjected to an external force. This second law demonstrates the force generated at the moment of contact is equal to the combined mass and acceleration of both the ball and bat. Hitters exploit this phenomenon in certain situations by swinging more easily to drop a hit between the infielders and outfielders. Newton’s second law is dramatically illustrated when hitters bunt, because the mass of the bat is not in motion. The mass acceleration is provided by the pitched baseball. A clever bunter uses the mass-acceleration factors at the moment of contact by allowing the barrel of the bat to react slightly to the force generated by the baseball. The result is a bunt that rolls to a stop short of an infielder. Newton’s Third Law of Motion states that for every action there is an equal and opposite reaction. Outfielders understand this in terms of a baseball that goes up must come down. Newton’s first law applies to the combined forces of air pressure and gravity that act upon a baseball hit in the air. Newton’s second law regarding force, mass and acceleration applies to how high and far the ball is hit. Outfielders learn to gauge the overall distance of fly balls just before the ball reaches the height of its arc. Exceptional outfielders have the ability to make the same calculations as the baseball begins rising when hit. An outfielder might realize the distance between his location and projected the arc of the ball make it impossible to catch certain balls on the fly. Outfielders use Newton's second law to get in position and field or catch fly balls. Base runners make calculations based on all three of Newton’s laws of motion∂, whether attempting to reach base on a hit or steal a base. Hitters set in motion toward first base and simultaneously calculate the speed of a ground ball or the distance of a fly ball. Based on the second law, the hitter might elect to hold at first or continue running for extra bases. 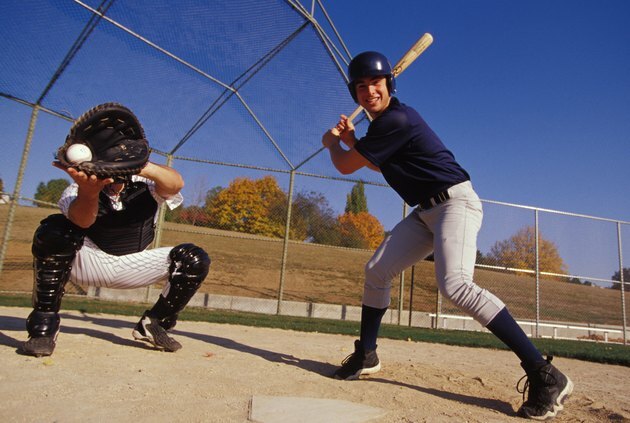 Proficient base stealers use Newton’s third law to calculate the time it takes a ball thrown by a fielder or outfielder to reach the targeted base. Hall of Fame leadoff hitter Ricky Henderson used his speed and the laws of motion to hit, get on base and steal a record 1,406 bases during a career that spanned 25 years.